Rice, a staple food loved by many, but intimidating to many who try to make this soft, pillowy, starchy goodness. As strange as this may sound, rice was one of my most feared culinary enemies. I had never tried to make it as all I had ever heard were horror stories of cooking on the stove top or in a rice cooker. Luckily for me, rice was always around when I wanted to have some and usually in large amounts. My best friend’s mom was Filipino and there was always rice, I mean always. How I learned to cook rice is a two part story. The first is, once again, I ended up falling in love with someone who could make rice and it made me happy as a clam. A few years ago, I became pretty ill and rice became, well, a staple while I worked to get myself healthy again. One day when I wanted to have rice and I used all I had earlier in the day, it became clear I needed to learn how to make it. So, when my girlfriend returned home from work, she began to teach me how to make rice so I could support my rice habit. The best thing about this recipe is it is pretty simple and works every time. 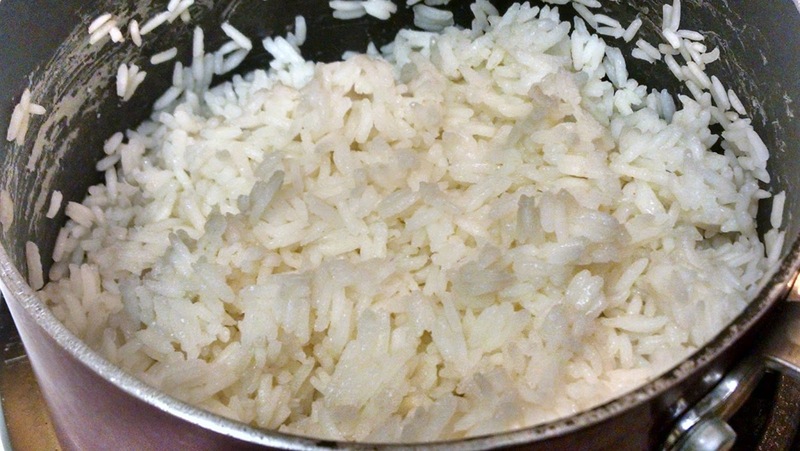 Although this is very basic recipe, rice can be used in any cuisine and with any cooking technique. Bring two cups of water to a boil and add the salt.Add the rice when water reaches a boil and turn the heat down to medium low. You want a very steady, gentle simmer for the rice to cook evenly — a rice sauna! 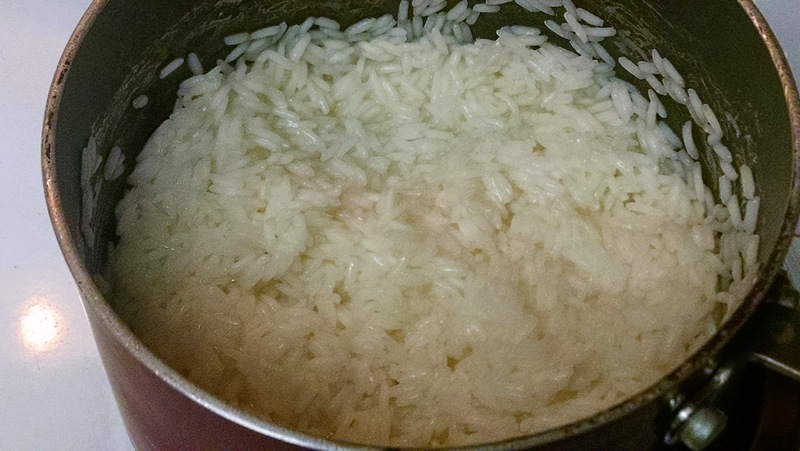 While the rice simmers stir ever 2-3 minutes so it does not stick to the bottom of the pan. 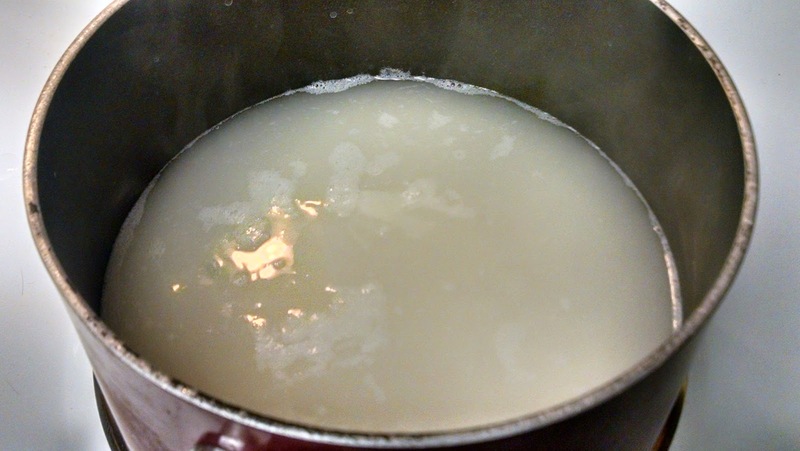 After most of the water has evaporated and absorbed by rice. You can easily recognize this point in the cooking process as the rice will be clearly exposed with a small amount of water in the pot. At this point, move rice to a cold burner and put a lid on the pot, leaving about a inch gap for steam to escape while the rice completes its cooking. After 10 minutes just fluff with a fork and serve. *Note: We like our rice slightly al dente, which means there’s a slight bite to each individual rice kernel. If you like your rice a bit softer you may cook it a couple of extra minutes on the heat and let additional water absorb/evaporate before letting it cool. You’ll see in the photo above the rice cooking at a gentle simmer. You will want the simmer to be a little more active than is visible here, but not a hard boil. OK, this photo shows you the point where you will want to pull the rice off the heat and move the pot to cold burner, partially covered with a lid. As noted above, if you want your rice to be a little softer and a little less moist than our recipe, let the rice remain on the heat a couple extra minutes. Just like that, you have cooked rice. So, we can all cross rice off the list of intimidating things to cook!